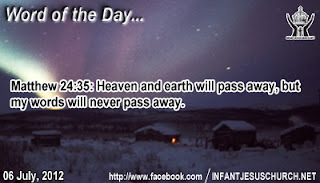 Matthew 24:35: Heaven and earth will pass away, but my words will never pass away. Heavenly Father, give us wisdom to discern what is truly lasting and invest our life in them. We want our life built on things that will never suffer decay. Thank you for sending Jesus to teach us truth that will last. We want to be obedient to his words and his life. Bless us in ways that help us live a life that is true. In the name of Infant Jesus, Our eternal Savior we pray. Amen. Jesus chose Matthew to be his disciple and friend, not because Matthew was religious or learned, accepted or saintly. Matthew appeared to be none of those. He chose to live a life of wealth and effortlessness. His profession was probably the most corrupted and despised by everybody because tax collectors made themselves rich by over-charging and aggressive to people if they did not hand over their money to them. What did Jesus see in Matthew that others did not notice? When the prophet Samuel came to the house of Jesse to anoint the prospect heir to the throne of Israel, he bypassed all the first seven sons and chose the last! "God looks at the heart and not at the look of a man" he declared. David's heart was like a compass looking for true north pole – it pointed to God. Matthew's heart have to have yearned for God, even though he challenged not show his face in a synagogue. When Jesus saw Matthew sitting at his tax office - no hesitation counting his day's profit - Jesus said only two words – "follow me". Those two words changed Matthew from a convenient profiteer to a God-serving apostle who would bring the wealth of God's kingdom to the poor and deprived.